During the 1910s, film criticism was flourishing with different schools of thought on what a Japanese film should and could be. Apart from the publicity magazines of film companies and fan magazines, there were also academic publications on the science and art of cinema, and left-leaning film journals that translated the Soviet montage theories of Eisenstein and Pudovkin. Two largely student-initatied publications that stood out were Kinema Record (founded in 1913) and Kinema Junpo (founded in 1919). Having been exposed to the films from Hollywood and Europe, the student writers were often critical of the Japanese films then. The lack of quality script-writing was a common lament. The writers were no armchair critics. Indeed, there was a sense that they were impatient for Japanese films to match up to the foreign films they much admired. Kinema Record sought to influence filmmakers and one of the founding editors, Norimasa Kaeriyama, even went on to lead the Pure Film (Jun Eiga Geki) movement. With the departure of Kaeriyama in 1917, Kinema Record was discontinued but its reformist spirit inspired subsequent publications. Generally regarded as the worthy successor of Kinema Record, Kinema Junpo was staffed with a diverse pool of talented critics who grew in prominence with the publication. Tadashi Iijima, a French literature major, advocated film as an art form and introduced the works of Moussinac, Epstein and Mitry. In contrast, Akira Iwasaki was a vocal left-wing critic, historian and producer, and a key member of Prokino, the Proletarian Film League of Japan (Nihon Puroretaria Eiga Domei). Today, Kinema Junpo is the longest surviving film magazine in the world. Cinemas of Asia speaks with Keiko Akechi, the Editor-in-chief of Kinema Junpo. 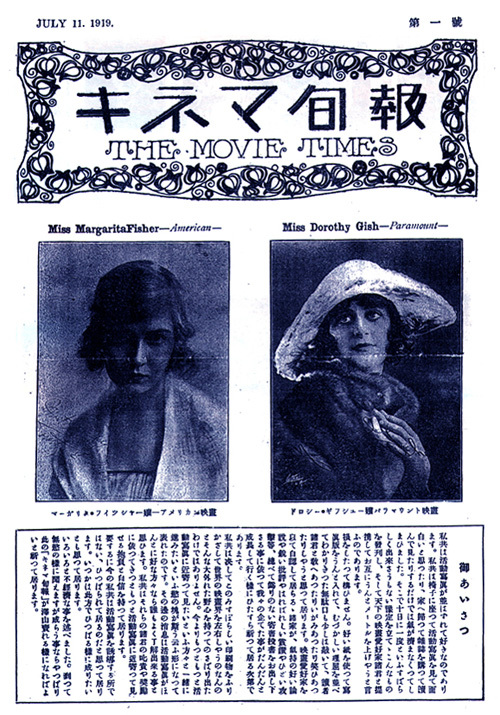 Cover of the first issue of Kinema Junpo in 1919. Image courtesy of Kinema Junpo. Bee Thiam (BT): Kinema Jumpo was first published in 1919, 13 years before the first issue of Sight & Sound (1932). Can you tell us how Kinema Junpo started? Who were behind it, why did they start the magazine and what were their inspirations? Keiko Akechi (AK): On July 11 1919, four college students wanted to get closer to movies, and so they created a paper that specialized in foreign films. The first issue was printed on four sheets of art paper, and came to be Kinema Jumpo. Since then, it was published three times a month (on the 1st, 11th and 21st). The magazine aimed to let films be known, and also to create a space for discourse on films, gradually establishing a platform for film criticism. Incidentally, the first issue had seven pieces of film criticism. Lilian Gish and Margarita Fischer were featured on the cover. The first Japanese actress to grace the cover is probably Keiko Kishi, in the hundredth anniversary reissue in the latter half of September 1954. 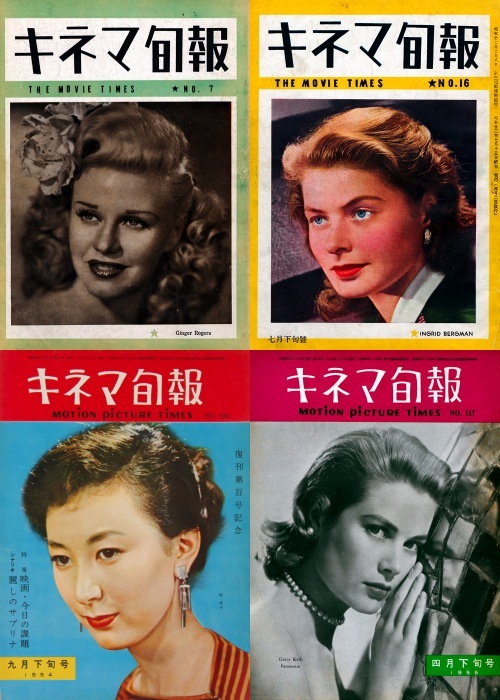 Ginger Rogers (1946), Ingrid Bergman (1947), Keiko Kishi (1954) and Grace Kelly (1955) on the covers of Kinema Junpo. Image courtesy of Kinema Junpo. BT: What would you regard as the milestones of Kinema Junpo? How has the magazine grown and developed? AK: With the variegation of entertainment, it has become increasingly difficult to cultivate young cinephiles. At the same time, there has been a proliferation of anonymous film criticism on the internet today. These circumstances greatly threaten the identity of a magazine that solely focuses on film criticism. In the midst of all this, we are trying to find ways to spread our past criticisms and interviews of cineastes beyond the pages of our magazine. BT: What was the relationship between the writers and the filmmakers? What kind of films and/or filmmakers did the magazine support and champion? AK: Instead of sticking to the auteur theory, we try instead to discover new value in each work. Consequently, we view filmmakers – whether they be young or experienced – on equal footing, discovering what is interesting in each of them from there. However, even amongst experienced filmmakers, there are many who have never had proper critical recognition. We try to acknowledge the talent of these filmmakers in view of the long tradition of cinema. BT: People usually associate the New French Wave with the Cahiers du Cinéma. Were there critics of Kinema Junpo who went on to become filmmakers of the New Japanese Wave too? AK: There have been a few critics of Kinema Jumpo who later became filmmakers: Masato Harada, Haruo Mizuno, Makoto Shinozaki, Chiyoko Tanaka. There might be more in the past too. BT: What would you regard to be some of the most important articles and writers in the history of the magazine? AK: We have been around for 93 years, so there can never be an appropriate answer to this question. Every article has a specific importance to the times in which it appeared. There were also innumerable critics who left their mark in history. However, I think that the best living film critic in Japan today is Mr. Yamada Koichi, who also contributed to Cahiers du Cinéma. BT: One of the most visible work of Kinema Junpo is the annual awards you give to honour the best of Japanese cinema. Can you tell us how this started and how the voting process works? Were there any highlights in the history of the awards? Were there also any years where the votes were particularly clear-cut or split? AK: The Kinema Jumpo Top Ten is an awards list of best films that is put together yearly from the votes of film critics. It was first put together in 1924. At the time, only the editors voted, and there were only two categories: Most Artistic Film and Most Entertaining Film. Only foreign films were eligible. As the quality of Japanese cinema improved, these were split into two sections in 1926: Japanese Film and Foreign Film. Excluding the years during the war when it wasn’t held, this list has reached its 84th year in 2010. It is the oldest awards list in the world (it is even older than the Academy Awards in the U.S., which only held its 83rd edition in 2011. Besides choosing ten of the best Japanese Films, Foreign Films, and Artistic Films, it also awards the Best Japanese Director Award, Best Foreign Director Award, Best Japanese Screenplay Award, Best Japanese Lead Actor Award, Best Japanese Lead Actress Award, Best Japanese Supporting Actor Award, Best Japanese Supporting Actress Award, Best Japanese Male Newcomer Award, Best Japanese Female Newcomer Award, Reader’s Choice for Best Japanese Director Award, Reader’s Choice for Best Foreign Director Award and other Kinema Jumpo Reader’s Choice Award for films and film auteurs that deserve praise. The voters are only restricted to people who have seen many films. Out of the large pool of voters (there were 119 voters in 2010), there are varying ages and specialties (film critics, film journalists), so they really reflect the trends in cinema. It has been called the most neutral and reliable voting process. Although it is not something noted exactly as highlights, the 80th edition in 2006 was held as a commemorative edition, where many previous Best Lead Actor and Best Lead Actress awardees showed up as presenters. Translated from Japanese by Daniel Hui. Special thanks to Matsushita Yumi.